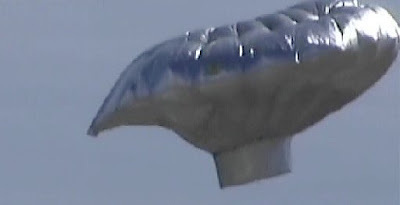 Over at NJ.com, I get a little indignant about the predictable over-coverage of the Balloon Boy coverage, which ate up way too much of my time today. Somewhere up there, Cronkite is simultaneously weeping and turning in his grave. Finally, Schultz let [Arianna Huffington] talk him into changing the subject to Vice President Joe Biden. Wait, was this so she could expand on her completely level-headed idea that it would be awesome if Biden resigned over a difference of opinion about Afghanistan? Are we talking about the Walter Cronkite who revolutionized editorializing by newsreaders? I think he was more likely nodding in approval today. "when you're covering a news story and there are, for the moment, no new pieces of information to discuss, stop covering the story for a little while"
Somebody should embroider that sentence on a sampler to hang in every 24-hour news office in America. Can we get "Overpromoted Cable News Nonsense" to be the next blog logo theme? Balloon Boy is going to be the most popular Halloween costume since Roy Horn was bitten by Montecore. The first network to cut away from the story and go to something else for a lack of new information will take a ratings hit for it. The people who have been watching for the balloon story -- and want more -- will change the channel to find it. People who heard about it some other way and turn on the TV to find out more information or see the pictures for the first time will go elsewhere if their usual channel isn't covering it. People say they want one thing, but the numbers show the opposite is true. I've seen it happen too often: taking the "high road" comes at a price. Producers who agree with you (and I'm one of those, by the way) lose their jobs or get tired of fighting losing battles. That's why the networks keep doing what they do -- giving the people what they want. I cannot WAIT to see Jon Stewart's reaction to this ridiculous mess. I was enjoying the coverage until MSNBC dragged out MC Hammer as a "shiny materials expert." Heather, I was thinking the same thing. I am hoping they didn't start taping the show until after this news story was resolved... but TDS isn't perfect because they did have Sully on as a guest this week. I just find the whole Wife Swap connection weird and I wonder if the media would have been notified had the parents not had prior experience with a reality show. Would the cops have contacted the media? I doubt it. There are many emergencies with kids every day and not everyone of them shows up on CNN. I watched the landing on the internet, heard the kid wasn't there, watched a couple minutes, figured it would be hours of angst, set my DVR for the ABC evening news and went off to do something else (online, but it was something else). By the time I watched the news, everyone sounded so upbeat, I figured they had found him. I was busy when Jessica was down the well. I heard about it in passing. I don't know what I was doing. But something recently reminded me of it. I didn't want to angst for hours. Thankfully I'm not in the news business. I desperately want you to be joking. Sadly, I don't think you are. Although, to be fair, this isn't a story about a kid who fell down the stairs. This is a story about a kid who was, at the time, believed to be in a giant homemade balloon shaped like a UFO. It's notable and unusual enough to justify some coverage. Just not the all-encompassing coverage it seems it received. What about how it was all probably fake thanks to Wolf Blitzer's interview of the family on CNN and the kid says, "It was all for the show?" Doesn't that make all of this worse? Great commentary as usual, Alan. I posted my comment without having seen the Wolf Blitzer interview. This really looks like a publicity stunt and frankly the parents look like media whores. No one is forcing them to do all these interviews after the fact. A simple statement saying they are happy he was found is all that is needed. I hope there is a bit more inquiry into this (not by the media, but the local authorities) because this is getting more and more suspicious. If the cable news channels showed restraint then that would make the TDS and Colbert Report writers have to work that much harder. In regards to Sully, I don't see why TDS can't have him on the show to promote his book. In the same way as Colbert had RZA. It wasn't wall to wall coverage or anything more than for a regular guest. Well, perhaps Jon Stewart was OTT with the praises but I didn't see it that way. It's not fair to lump Sully with Balloon Boy. The Balloon Boy thing was the biggest news story of the day. It was a constantly developing news story every second the balloon was in the air and every subsequent second until the kid was found. In fact, it's still a developing second-day story thanks to the kid's slip on Larry Blitzer that may have revealed it was all a hoax. Any news organization that passes up a chance to cover a developing story to present a talking-head interview hardly deserves to be called a news organization. Ridiculous or not, this is a BIG story. Period. And it's certainly got more up-to-the-minute news value than Arianna Huffington's latest opinion...not least because Huffington's opinions aren't exactly constant or hard to find. Really, shouldn't he be known as ATTIC boy? Earlier this week Jon Stewart had a montage of cable news anchors interviewing people on important subjects, then cutting them off with "we're going to have to leave that there." Stewart's question was why can't 24-hour news find the time to finish the question or answer. I guess they're too busy covering balloon boy, wall-to-wall. The world has actually turned into a Mr. Show sketch. Ridiculous or not, this is a BIG story. Period. Loved the snarkiness of the final line... "Won't someone think of the children..." I wonder if Helen Lovejoy is mad you stole her thunder? Why's it a big story? Because people across the country were glued to their tv and computer screens, following it. I'm a newspaper reporter, and literally everyone in my newsroom -- news, sports, features, photo -- was either glued to the TV or frantically googling to get the latest scoop. (Props, BTW, to the NYT's The Lede blog, which I thought did the best job as an information clearinghouse through the afternoon). There's no need for this whole more-in-sorrow-than-in-anger rigmarole every time people are fascinated by an ephemeral cable-news story. 24-hour news cycles feed on ephemera by their very nature, but that doesn't make them bad. And as I said earlier, the idea that the greater tragedy was that MSNBC viewers were denied the chance to hear from Arianna Huffington really puts the silliness of the whole thing into perspective. Collin, as someone who also spends a lot of time in a newsroom, I don't think the behavior within it should be considered representative of America as a whole. It's the disease of more, and fear of the other guy having something you don't. I've had to write far too many stories in my career where the editor's only justification for me doing it was "the other guys have it, and we'll look bad if we don't." That's also, I'm sure, why so many people in your newsroom, and in mine, were so fixated on Balloon Boy - because they knew some or all of them would have to write about it. And, yeah, Huffington is silly and self-serving, but she was also right in this case. Alan, thanks for your great article and a forum full of intelligent commenters! I work in the book industry, and we've put out about 50 cheap books of adorable cat photos because they sell so much better than impressive, interesting, a-little-more-expensive books. Taking the high road is great in your personal life (I own 2 cats but no books of cat photos), but at work, the name of the game is MONEY, not what's "right." I think this necessary homogenizing is why the internet is so popular--people can find niche publications and everything is free. As far as the news networks go, I think the game-changer will have to be a NEW news network. One that doesn't try to be a competitor to the big guys at first, and takes the high road from the beginning. Finally (sorry this comment is getting so long), I am very interested in the conversation that Nicole brought up re Wife Swap (and from what I read the family contacted the media directly, supposedly to use their helicopter). It reminds me a lot of Jon & Kate in the way that reality tv stars see tv (and probably, the world) differently than the rest of us. I preface this by saying that the only "coverage" I "saw" was via posts on Facebook by friends. On the other hand, one of those posts called that the kid wasn't in the balloon while it was still aloft. That's because my friend figured out/knew how much lift the amount of helium you could put in a balloon that size would cause...30 pounds. So unless that was one tiny 6 year old, there's no way he could be in that flying around balloon. I didn't hear anything about any of the coverage bothering to get someone to figure how many pounds such a balloon could lift, which wouldn't be particularly hard to do. Of course, that'd also mean realizing there was no story about a kid trapped in a balloon. It was kind of funny that Arianna Huffington would complain about coverage of non-news stories when Huffington Post has a ton of celebrity/non-news stories on their front page. The coverage was the right amount until they started "speculating" on how "weird" the family was and the hours spent on CNN after we knew the kid wasn't on the thing. It underlines how ignorant newsrooms are of basic science and simple arithmetic. That volume of helium could never loft a 60-pound child. As various folks in my household saw the size of the balloon, everyone's first reaction was that the balloon waving in the wind was carrying no load. Maybe the first call producers should make on a story like this is Adam and Jamie at Mythbusters. They needed thousands of carnival-size balloons to lift a kid around the same size. What's worse, Dad certainly knew that the balloon was insufficient to the task and perpetuated the hoax.